As stated by Pageaux (2016), the Oxford Dictionary defines effort as “strenuous physical or mental exertion” and exertion as “physical or mental effort.” Perception of effort is a cognitive feeling of work associated with voluntary actions, and is crucial for the judgment of personal actions; thus, both terms exertion and effort would not be dissociated and either are considered synonymous. Indeed distinctions between effort and exertion cannot be made when presenting results from previous studies. What needs to be differentiated is the perception of effort/exertion from the perception of force. Effort refers to the difficulty of driving the limb involved in the exercise, force refers to the sensations of muscle tension experienced during muscle contraction (Pageaux, 2016). The lack of clear instructions could have been the cause of controversial results or difficulties in using the perception of effort for controlling resistance exercises. For instance, if an athlete is instructed to express his/her level of force experienced during a set to failure using a very light load (~30 to 50% 1 RM), although the effort is maximum when reaching the muscular failure, comparing to the maximal possible force the athlete is able to apply when moving heavier resistances (~100% 1 RM), the resulted score to evaluate the force, not the effort, can be “lower” than expected. Therefore, in order to properly use perceptual scales, coaches and researchers are encouraged to establish a consensus on how to interpret the anchoring and instructional procedures. We have proposed the OMNI-RES Scale published by Robertson et al., (2003) as an effective tool for selecting the load and estimating mechanical changes occurring across continuous sets during upper (Naclerio et al., 2011) and lower body (Chapman et al., 2017) resistance exercises. The aforementioned scale has both verbal and mode-specific pictorial descriptors distributed along a comparatively narrow response range of 0 to10. These characteristics make the OMNI scale a useful tool to control resistance exercises. In our laboratory we consider the overall OMNI-RES value to express “how hard does the athlete feel his/her muscles are working during the exercise”. 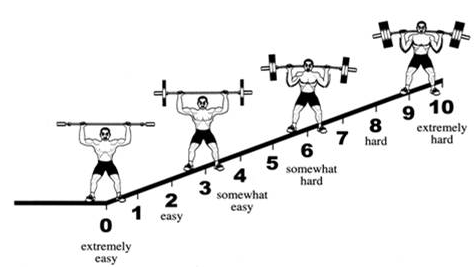 A rating of 0 is associated with no effort (seating or resting), and a rating of 1 correspond to the perception of effort while performing an extremely easy effort whilst a rating of 10 is associated with the most stressful exercise ever performed (regardless of the load). CHAPMAN, M., LARUMBE-ZABALA, E., GOSS-SAMPSON, M., COLPUS, M., TRIPLETT, N. T. & NACLERIO, F. 2017. Perceptual, Mechanical And Electromyographic Responses To Different Relative Loads In The Parallel Squat. J Strength Cond Res. NACLERIO, F., RODRÍGUEZ-ROMO, G., BARRIOPEDRO-MORO, M. I., JIMENEZ, A., ALAVAR, B. & TRIPLETT, N. T. 2011. Control of resistance training intensiy by the omni perceived exertion scale. J. Strength Cond. Res, 25, 1879–1888. PAGEAUX, B. 2016. Perception of effort in Exercise Science: Definition, measurement and perspectives. Eur J Sport Sci, 1-10. ROBERTSON, R. J., GOSS, F. L., RUTKOWSKI, J., LENZ, B., DIXON, C., TIMMER, J., FRAZEE, K., DUBE, J. & ANDREACCI, J. 2003. Concurrent Validation of the OMNI Perceived Exertion Scale For Resistance Exercise. Med Sci. Sport Exerc, 35, 333-341.